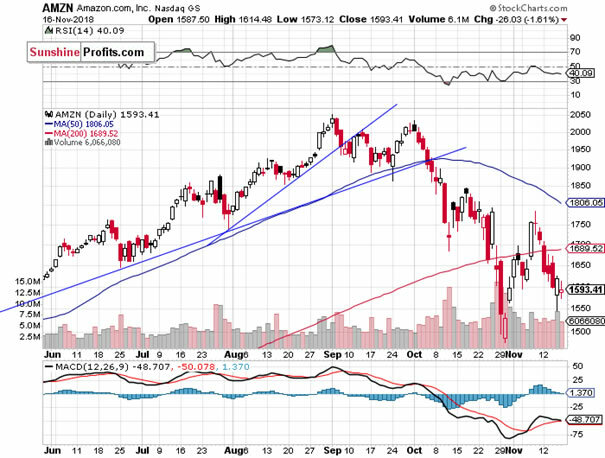 Stock Market Going Sideways - Which Direction is Next? Friday's trading session was mixed, as investors continued to hesitate following the recent decline. The S&P 500 index extends its month-long fluctuations along the level of 2,700. Is this some medium-term bottoming pattern? The U.S. stock market indexes were mixed between -0.2% and +0.5% on Friday, extending their short-term fluctuations, as investors continued to hesitate following last week's sell-off. The S&P 500 index remains above 2,700 mark after bouncing off the support level on Wednesday-Thursday. The index was 11.5% below September the 21st record high of 2,940.91 three weeks ago. And now it trades 7.0% below the all-time high. The Dow Jones Industrial Average gained 0.5% and the Nasdaq Composite lost 0.2% on Friday. 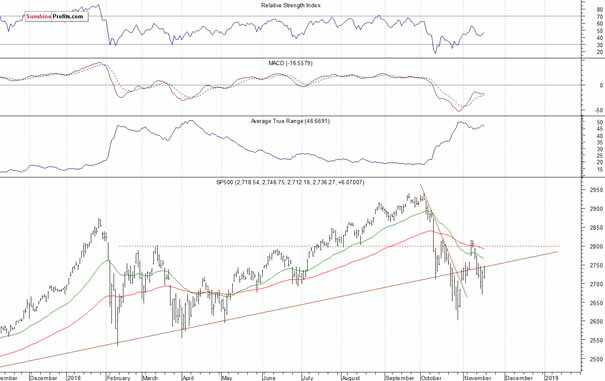 The nearest important level of resistance of the S&P 500 index remains at around 2,750-2,775, marked by the recent support level and the short-term local highs. The next resistance level is at 2,795-2,800, marked by Friday's daily gap down of 2,794.10-2,794.99, among others. 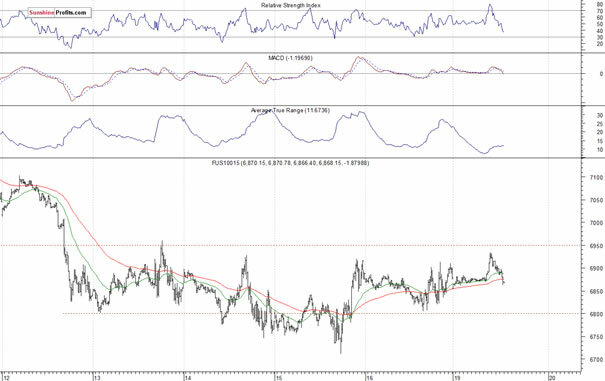 The resistance level is also at 2,815-2,820, marked by the mid-October local high of 2,816.94. On the other hand, the support level remains at 2,700, marked by the previous short-term consolidation. The next support level is at 2,685, marked by the late October daily gap up. 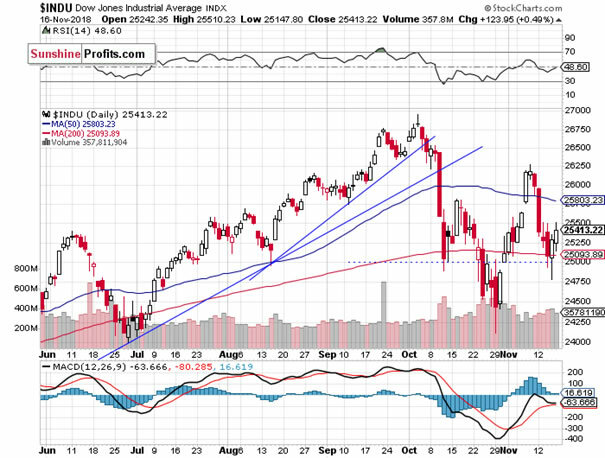 The support level is also at 2,600-2,630, marked by the late October lows. Expectations before the opening of today's trading session are negative, because the index futures contracts trade 0.4% below their Friday's closing prices. The European stock market indexes have been mixed so far. Investors will wait for the NAHB Housing Market Index release at 10:00 a.m. The broad stock market will likely continue its short-term fluctuations this morning. We may see another attempt at breaking above the resistance level. 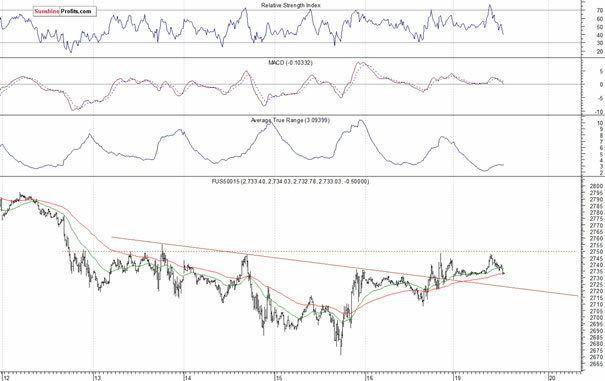 However, there have been no confirmed short-term positive signals so far. Big Cap Tech Stocks Bouncing - Upward Correction? The S&P 500 index extended its short-term downtrend last week, as it fell below 2,700 mark on Wednesday and on Thursday. 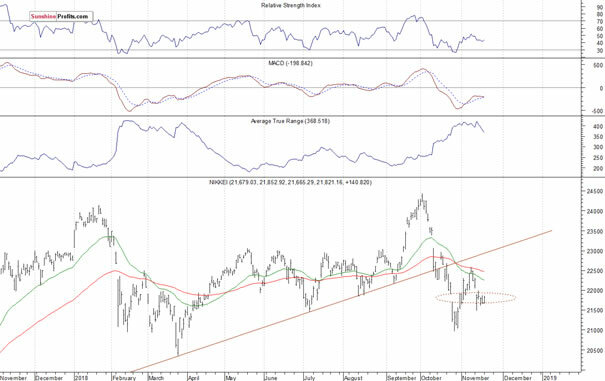 On Friday the broad stock market bounced, but it continued to trade below the short-term local highs. On the other hand, the index continues to trade above the support level of the October the 31st daily gap up. Concluding, the S&P 500 index will probably open lower today and it will likely extend its last week's short-term consolidation. 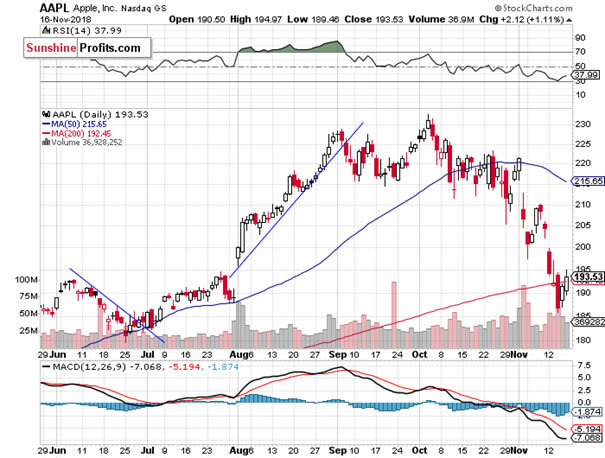 For now it looks like consolidation within a downtrend. We may see more short-term volatility.